Following last week’s Q1 National Accounts, I cheekily suggested that the domestic economy was in recession. Many of my peers also made the same observation — with more or less degrees of seriousness. Along this line, some focused on Western Australia, which had been the heart of the domestic demand boom, and where things had clearly changed (annual growth in WA’s domestic demand had slowed from ~15% to 0% over the past year). Mark the Graph has just posted a very careful analysis that looks at this question — and comes to a worrying conclusion. I had been reasonably sceptical about the prospects of a GDP recession (two quarters of declining GDP), but Mark’s analysis has made me more open minded. I had simply assumed that the third phase of the mining boom (the one we are entering) would be characterised by fewer capital goods imports and lots more exports — which means net exports would hold up GDP and keep Australia well-clear of an output contraction. The speed of WA’s decline calls that into question — can we grow exports that quickly? What always seemed likely to me was that there would be a material increase in unemployment, as the investment phase matured into a net-export boom. This seemed very likely, as the investment phase of these mining projects is much more labour intensive than the production phase. On this point, Mark finds that WA has already satisfied an alternate (better) definition of recession — a 150bps increase in the unemployment rate (i have reproduced his chart, above). in SA terms, the unemployment rate is 170bps higher in only 10 months. Of course, we are not quite there yet in trend terms — but come Thursday’s jobs report, it is very possible that the WA unemployment rate will have risen further and this will pull the trend estimate higher. So come Thursday mid-day, it may well be reasonable to declare recession in WA. I continue to expect the RBA to cut 25bps in July and retain their easing bias — their demand test has clearly been met. This entry was posted in AUD, economics, monetary policy, RBA and tagged RBA, recession, WA. Bookmark the permalink. no two successive quarters of GDP does not mean a recession at all. A doubling in the unemployment. WA final demand maybe down but exports would bring it well above the the positive line! that battle has been fought lost a long time ago — ordinary folks like things to be clear. The purpose of macro policy (and macro theory) is to try and keep people in work, so i think the 150bps on the unemployment definition is both good and policy relevant. 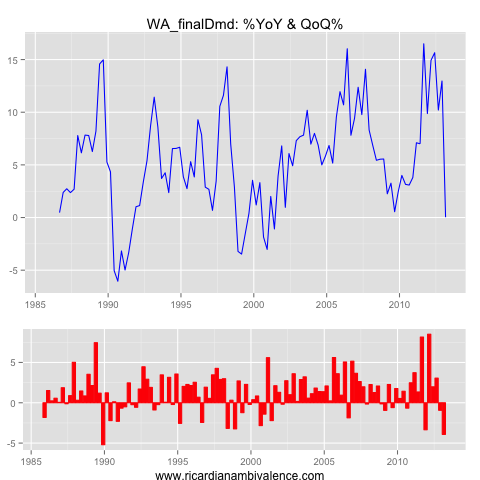 Check Mark’s post — he cobbles together a GDP estimate for WA using trade data. I shared your faith in NX before i read it, but even with his est of trade, the drop in Q1 is sharp. Looking back on this post appear you and Mark jumped the gun when calling a WA recession don’t you think? Net exports was never going to be enough. We need consumption and housing investment. I think I said a while back that house prices needed to rise 10% this year or we’d see a recession. I still subscribe to that broad view. the economy has that ‘snapped’ feel to it, doesn’t it … be interesting to see how confidence fares given all this negative chatter about recession. Well, then we’ll have a recession because house prices are not going to rise 10% this year. hmm am I missing something or is everyone just reading a bit too much into the latest gdp data. That and the WA ur rate just looks to be suffering the current end wobbles take the latest month blip out and its sitting around 4.5%. How is that suggestive of a recession? Yes things look to be transitioning but was the ultra hot WA economy really sustainable and is it really reflective of reality to pin the word recession to a state that has an unemployment rate of less than 5%? I’d rather wait and see before getting too excited. 3. The change in the UR is important – if May’s print continues to climb – I might change my view on 1. 4. A 5% UR is irrelevant – in the first 1970s recession the UR peaked at around 5% – it’s the change that is important, not the end point. Just a quick point the 70’s recession may have stabilised at 5% but continued to climb through the 80’s and reached 9.5% before any meaningful drop. So yes I agree change is important and the ’70’s recession’ wasn’t the endpoint for that particular period of ‘recessionary’ unemployment. i think that long term change was mostly micro stuff. Then does that period represent a failure in macro policy? Anyway does it really matter if it was micro or macro policy? By your own standards it suggests a highly recessionary period. well, there are two takes on the period — one is path dependency, with high unemployment leading to a higher NAIRU, and the other is some sort of micro economic change. probably there’s a bit of both, but i favour micro for these decade long changes. I like that paper as well. But, i don’t think it’s right to assume that the revisions will continue to be positive. The revisions have been upward for a while now — just like almost all forecast errors. And as you have said a few times, initial GDP estimates are as much forecasts as they are reality. My judgement is that both have the same sign as we have been in a long term boom. The point of all this speculation is that it looks like that boom has come to an end. anyhow, say you are right and the WA unemployment rate is around 4.5% … so it’s gone up ~80bps in three quarters. I’d say that it’s appropriate that we ought to be looking at WA to understand what’s going on — as clearly something has changed. Anyhow, don’t read my views, have a look at Mark’s very good post. I agree with both of you that change is a happening, but its changing from something that was in a crazy state that was in no way sustainable. While all the indicators point to change I don’t think the R word should be bandied about…at least no just yet. It could simply mean things are shifting to something which is more sustainable. Like you have said before Ricardo the main game is employment and while the e to p has been dropping in WA male employment is still way above the pre boom levels as is female employment. Yes the UR has risen 80bps but look at the level it has risen from. It was ridiculously low and was always going to rise. That doesn’t mean recession it means change. Change that may result in a period of decreased employment but it hasn’t happened yet nor is it even close…yet. 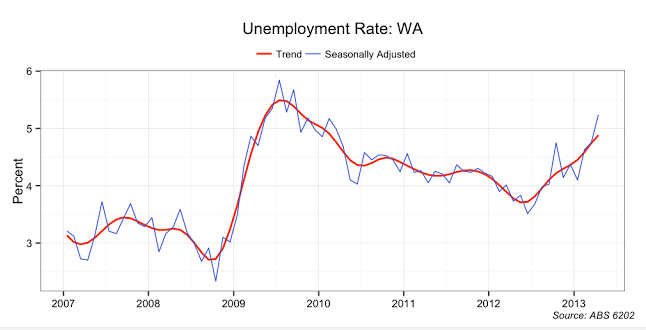 I would also point you both to the underemployment rate for WA which is relatively steady. As I’ve discussed with you before ricardo ‘unemployment’ gives only a marginal clue about untapped supply. Most demand is met by PT workers and thus underemployment gives in my opinion a better idea about the state of the labour market. this is all very good and accurate, but if WA moves from unsustainable to sustainable, and sustainable happens to be smaller, isn’t it technically sound to say that the WA economy has shrunk? if so, then what we have is a recession…. Yes yes if all these things happen then technically the label fits. But simply labelling it in the hysterical way some analysts have (not here) suggests the WA economy is comparable to the Tassie economy. Where all that has happen is that for about 4 years it grew at an unsustainable rate and may be slipping back to a more sustainable level. Overall, the economy in WA is in rude health. Tassie on the other hand is terminal. So yes WA may in time fit the definition of recession that’s been used, but who cares if all thats happened is that medium to long term growth is still up. Shouldn’t analysis of the health of an economy reflect the medium to long term trends and not short term blips. Because after all, analysis is used to inform policy and last time I checked, policy to remedy short term blips is considered by many to be irresponsible and largely ineffective. Housing and consumption are not going to help if credit growth remains subdue at 4% p.a. and the saving rate stays at 10%. The ball is in china’s field. But that does not look promising either, does it? “China Export Growth Plummets Amid Fake-Shipment Crackdown”. To be honest, I do not think we can afford to have unemployment > 6% with household so indebted already: in that case we’ll see private debt converted into public debt and the public deficit will explode to European levels, and good bye triple A. While it’s interesting to debate whether WA is in recession, it isn’t directly relevant to mon pol is it? Whether a particular state is in recession or in terminal decline is if anything a matter for fiscal policy, not a concern of the RBA. So long as the national pick up in domestic consumption and housing investment is sufficient, do we care? agreed — in general we focus on national aggs. but we might care if we think WA has been the ‘driver’ of something national, and that a change might have national implications. i think that’s the reason for the focus. Only if you haven’t been paying attention to what’s been going on outside WA. It will be interesting to see what happens in WA from the perspective of transitioning. I suspect the state govt is ill prepared for what may be happening and will be caught with their pants down…and if this is the first sign of change then yes it may mean WA is in trouble. But on the flip side this should mean the $AUD sensitive industries should benefit, which should mean more diversified state economies (NSW, Vic.) should benefit…shouldn’t they? Very interesting times! Good discussion as well. You are right, but it will take time for that benefit to be felt. It took a few years (3?) for the pain of the high AUD to be finally felt and be completely understood, likewise it will take a few years for the benefit of a falling AUD to be of significance on the economy. Tourism, education, exports, do not turn in a few months. Plus, who knows if it will really fall much more or bounce back? A lot of it is not in our hands unfortunately. The most interesting thing IMO is how imported goods prices will react to a falling AUD. Businesses will want to pass increases to consumers, but is there enough demand for that to happen? From business surveys it does not look like businesses have much pricing power right now, they all complain costs are going up while revenues are not. So now a lower AUD could be an additional higher cost in the medium term. Overall , I do not know what you all think, but such an extremely variable currency it’s not really a positive IMO, like everything that is unknown in a business. I would prefer a stable currency, high or low. We were just starting to talk about how the Australian economy has adapted to a high currency, and, voila’, everything is changing …. again!